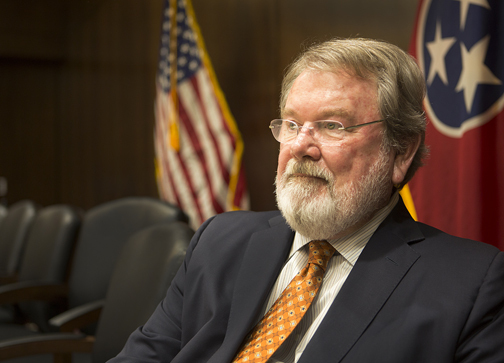 Steve McDaniel is one of the longest-serving members in the Tennessee House of Representatives, representing District 72 in Middle and West Tennessee for 30 years. He plans to retire this year. He’d found an old handgun when he was around 8 years old and showed it to a great-uncle, a World War I veteran who told him it was a cap-and-ball pistol from the Civil War. It piqued his interest, and as he grew up in the area rich with Civil War history – his father even farmed a part of the battlefield – McDaniel read more about the war. “It’s really the only hobby I have, history,” says McDaniel, Republican deputy speaker who is leaving the Legislature at the end of this session after 30 years representing District 72 in rural Henderson, Chester, Decatur and Perry counties on the edge of Middle and West Tennessee around the Tennessee River. He joined a re-enactment group as soon as he graduated from the University of Memphis in 1973. He’s a member of the Sons of Confederate Veterans, and his legislative bio notes his interests include Southern historic preservation. Sporting a full beard and mustache, the 66-year-old McDaniel looks as if he could stand in for a Confederate general. Yet McDaniel acknowledges he “galvanizes” in re-enactments, portraying Union as well as Southern troops to make sure the events are historically accurate. A part-time mayor of the town of Parkers Crossroads, he plans to continue in that post after leaving the Legislature but wants to travel to more historic sites, mainly Civil War battlefields, and spend time with his wife, Phyllis Taylor, visiting their young grandchild. His daughter, Andrea McDaniel Smith, and her husband, Congressman Adrian Smith, live in Nebraska. In his final session, though, he’s hardly coasting, and even finds himself at odds with the Republican leadership at times, particularly concerning health care in rural areas. But, historic preservation remains on his agenda. McDaniel finds himself in the midst of a debate over Confederate monuments and the Tennessee Heritage Protection Act of 2016, a measure he considers the hallmark of his legislative career. “I love history and I’m really proud of that act because I think it will help preserve a lot of our history for posterity,” McDaniel says. 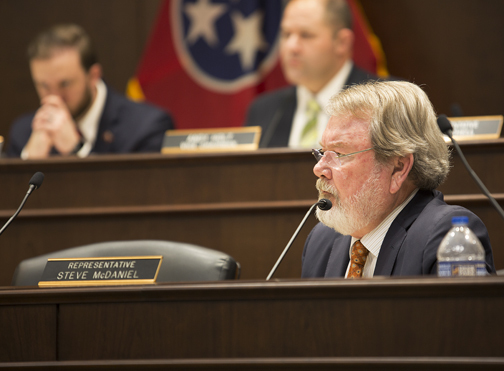 McDaniel and Sen. Bill Ketron amended the law in 2017, requiring a two-thirds vote of the Tennessee Historical Commission to approve a waiver enabling any group to change the name or location of a historical marker, monument or name related to military history in Tennessee. Critics of the law say it was enacted to stop groups from taking down Confederate monuments as more people across the nation view them as racially polarizing. Memphis leaders, for example, had for years been trying to remove a Forrest monument in a city park. McDaniel, however, says he was motivated to sponsor the legislation to preserve military history in Tennessee, not to “head off” efforts to take down Confederate statues and monuments. “Other states had had light versions, very light versions of this, and I just saw the need to set up a process whereby the public is informed on what a proposal might be and they can become involved in that process through this legislation,” McDaniel points out. The longtime legislator concedes the Memphis City Council “did something very unique,” finding a “hole” in the law when a Shelby County commissioner set up a nonprofit organization, Greenspace, which bought two city parks from Memphis and removed an equestrian statue of Forrest from his grave site and a statue of Confederate President Jefferson Davis. The nonprofit organization removed them the night the City Council approved the sale of the parks for $1,000 each. House Republicans immediately called for a State Comptroller investigation of the deal to see whether the City Council broke any laws or circumvented the spirit of the state law governing military monuments. The Comptroller’s Office recently found the council provided sufficient notice for meetings and didn’t violate the Open Meetings Act as well as its own ordinances allowing the sale of parks to a nonprofit group at less than market value. The comptroller also recommended the city enter a formal memorandum with Memphis Greenspace because it fell short on following its own guidelines in gauging the organization’s financial strength and stability. The Forrest family and Sons of Confederate Veterans also challenged the council, filing a complaint claiming grave desecration and a violation of state law. Memphis officials took the unprecedented step after the Tennessee Historical Commission turned down their request for a waiver to remove the statues. Memphis and Tennessee also were in the midst of a legal fight when the statues came down. A Davidson County chancellor ordered the matter to go before the state Historical Commission to determine whether Memphis broke the law. Regardless of the outcome, McDaniel is sponsoring legislation this session to “fix the loophole” by requiring local governments to go before the Historical Commission even if they plan to sell property with military monuments to a nonprofit organization. Steve McDaniel, deputy house speaker during an agricultural hearing at the Cordell Hull Building. It’s one of at least four bills designed to punish Memphis or pre-empt similar moves across the state, though McDaniel’s bill isn’t retroactive and wouldn’t affect what took place in the Bluff City. Members of the Legislature’s Black Caucus are most critical of legislative efforts to penalize Memphis, saying city residents were weary of having the statue of Forrest, a slave trader and first grand wizard of the Ku Klux Klan, glaring down at them at the city park. McDaniel says he can understand how people are bothered by Forrest’s connection with the KKK just after the Civil War, but he adds many Tennesseans choose to pick the “dark side of (Forrest’s) experience and reputation.” The legislator points out Forrest’s military tactics are still studied today. “None of us today would want to enslave another human being. But we have to look at history and individuals in context of their time, before we start passing judgment on whether they did something wrong or not,” McDaniel explains. Republican Sen. Frank Nicely of Strawberry Plains lambasts Memphis’ actions and contends Forrest, after the war, urged Memphis’ black residents to find successful careers during a speech to the forerunner of the NAACP. He is sponsoring legislation enabling the state to take local government properties by eminent domain when military monuments are removed without state permission. “Steve’s a great historian. He’s done a lot,” says Nicely, an East Tennessean who was in the 1988 House freshmen class with McDaniel and House Speaker Beth Harwell. Nicely points toward the importance of McDaniel’s work on the Parkers Crossroads Battlefield and notes the amount of national interest in Civil War sites and the tourism they draw. Fitzhugh, though, says he believes the Heritage Protection Act ties local government’s hands too much, taking away local control. Nevertheless, he says, McDaniel sponsored the measure because of his love for history and calls him a straighter shooter who has represented his district well over the years. “He has a genuine desire in that part of our history and for the right reasons, too, not using it as some sort of subterfuge for any kind of white supremacy or nationalism or that type of stuff,” Fitzhugh acknowledges. McDaniel made two somewhat surprising statements for a Republican in leadership before the final year of the 110th General Assembly started, first backing an expansion of Medicaid, then saying he opposes a new policy allowing permit holders to carry guns inside the revamped Cordell Hull Building where the Legislature conducts business. The Republican-controlled Legislature declined to pass Gov. Bill Haslam’s 2016 Insure Tennessee proposal to catch some 290,000 people in a gap between TennCare and Affordable Care Act coverage. But when the Decatur County Hospital announced late last year it would be closing, McDaniel said Medicaid expansion might have helped it stay afloat. And though Medicaid expansion wouldn’t have guaranteed the Decatur County Hospital’s solvency, he adds he believes increased Medicaid coverage would have allowed the hospital to be compensated for the care it provides to under-insured and uninsured patients. McDaniel points out the mean family income in his district is $31,000 annually compared to $130,000 a year in areas such as Williamson County, a major difference between his constituents and those in more affluent areas. “I know there’s people opposed to the Medicaid expansion who represent exactly the same kind of district I have, and I just don’t understand the logic of not wanting coverage for people who don’t have health insurance,” he continues. McDaniel says he doesn’t see the financial risk to the state, either, of expanding Medicaid, with the feds promising to pay 90 percent of the cost. If the federal government were to pull back, he notes, the state could take people off the rolls as it did during Gov. Phil Bredesen’s administration. McDaniel didn’t hesitate, either, in saying he disagrees with the decision by Speaker Harwell and Lt. Gov. Randy McNally to allow conceal-carry permit holders to bring weapons into the Cordell Hull Building. Guns remain prohibited in the State Capitol. McDaniel says he believes in the right to carry and holds a conceal-carry permit but adds he doesn’t believe people should be carrying guns in Cordell Hull or the Capitol. “Just because you have a conceal-carry permit doesn’t always mean you’re a sane person, because we don’t necessarily do psychological checks when you get the permit and you don’t do checks as time goes on either,” he says. “It puts you in a position where you need to carry a gun because some crazy person may come in here with a gun now and start shooting and so you need a gun to protect yourself,” he adds. McDaniel’s perspective runs counter to that of most Republican legislators who say they’re not worried about permit holders shooting up the building. As Fitzhugh says, though, McDaniel is “his own man,” focusing most of his House career on constituent service instead of trying to pass legislation for the sake of legislating. For instance, McDaniel says the Legislature needs to concentrate this session on passing meaningful changes to solve the state’s opioid crisis. “I’ve been honest and I’ve worked hard, and that’s all I promised the first time I ran,” McDaniel explains.